My site has been a bit stagnent for a while I know. I've been working on a new milkshake mixer for Stricoff Fine Art, Ltd., and it's taken nearly all of that time to complete. This is similar to the last incarnation, but I wanted to paint the mixing blades. I just though they looked cool. I'll be shipping this up to them in a week or so. In the mean time I've begun a new group of ebay paintings. I've got four underpaintings done, and hopefully I'll get number five done today. If all goes well number one will be listed on monday night. Karen and I will be going out tonight to attend the opening night reception of our friend Leslie Cohen. She's having a one man show at the Heaven Blue Rose Gallery in Roswell. The image above doesn't do her work justice. She utilizes a technique which replicates hand etching, and it is equisitely beautiful. You need to see her paintings in person to fully appreciate them. Leslie and her husband Jeff have also recently been taken on by the Wynne/Falconer gallery on Cape Cod. They will be having a two-man show there on September 6th. I wanted to get a fifth painting up for my "week" of ebay paintings. I could only manage to get four up last week. 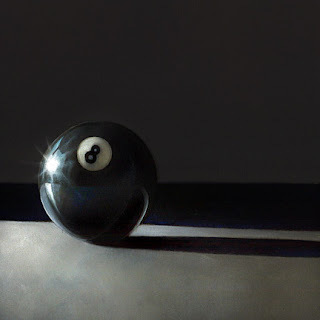 The portrait didn't survive, so I replaced it with this eight ball. 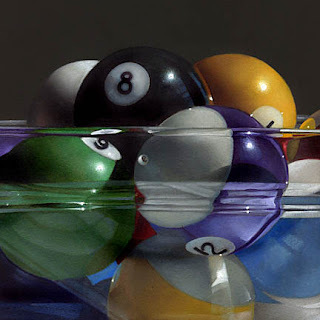 I really enjoy painting pool balls, but there is something special about the black one. It's a challenge working only in blacks, blues and shades of grey. This is another subject I'd like to try large one day. The third commissioned piece is on temporary hold while I paint a third Hamilton Beach milkshake mixer for Stricoff Fine Art, Ltd. I recently got the word that they had sold the last one, and would love to have another. The affordable art fair is coming up soon in New York, and I thought it would be a good idea to have it up there in time for that. I'll get back to the commission when the mixer is complete. If anyone is interested in bidding on this piece you can access the auction by clicking here. I'm not positive, but I think this is the sixth incarnation of this particular theme. Karen is always encouraging me to, "do more bread", so here is more bread. Not complaining. 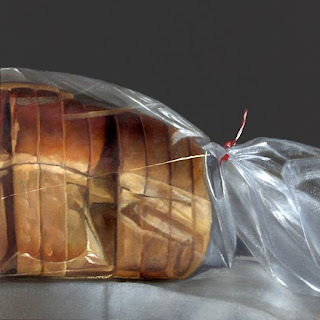 I really enjoy painting bread. And plastic too. I spent the day working on the first pass of a portrait. A 6 x 6 intended for ebay, but I'm not sure what I think of it yet. I had been jonesing to paint a face for sometime, but I'm pretty rusty, and it may never make it to the blog. I'll have to wait, and see how the subsequent layers turn out. 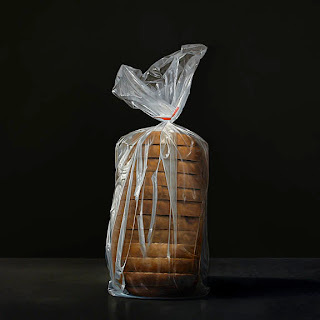 Anyone interested in bidding on the Bread Bag, can access the auction by clicking here. "It is very likely, that in the future, there will be a few more paintings similar to this one". And here it is. 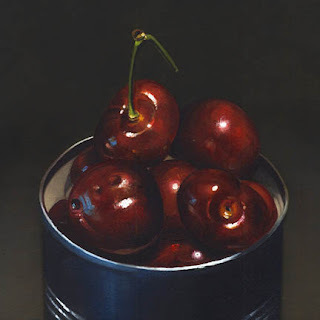 This is yet another composition of the the Cherry Can I painted for the winter show at Twinhouse. I took a lot of photographs of this subject, and always intended to utilize more of the many images resulting from that shoot. Work on the third full sized commission painting should begin in a couple of days. When I think about it today, I think it will probably be the coffee bag. I'll know friday morning when I set down at my easel. Anyone interested in bidding on the Cherry Can can link to the auction by clicking here. 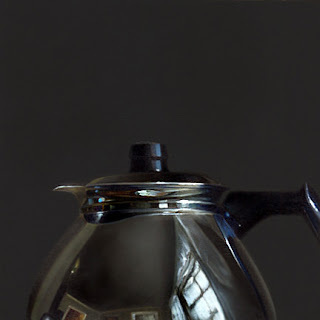 It's been a little while since I had done something "shiny", so I went back to my favorite percolator. I inherited this Coffee Master from my folks who had received it as a wedding gift in 1951. They knew that I had coveted it since childhood, so they let me have it when they moved into their current apartment. It's still in great shape, and I suppose it would make a good cup of coffee if I gave it a chance. The percolator comes in two parts, and has such a wonderful shape. It distorts its' surroundings beautifully. A great subject for painting! It you'd like to bid on this painting, you can access the auction by clicking here. 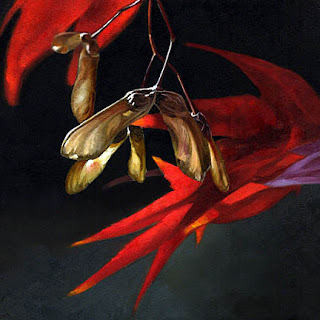 Last year I painted a couple of maple leaf compositions, and really enjoyed doing them. They received a of attention, and resulted in a commission to do another as the logo for a new wine offered by the Maple Vineyards in California. So, I figured I paint another. Create an opportunity to use some red paint. I still haven't decided on which of the corporate pieces I'll do next. I may have to flip a coin. That can wait until I complete this group of ebay paintings. Which ever of these compositions gets the nod, it should be started by the end of this week. Those of you who may be interested in bidding on the painting above, can link to the auction by clicking here. Here is the second of five commissioned paintings for the Printpack Corporation. Number three may be the strawberry bag. I'm sort of on a roll with the plastic wrap, and was thinking it would be a good idea to use that momentum, and continue with that theme. The response to the study on ebay was encouraging, but I am torn because of the fact that I'm really itching to paint the coffee bag, and hershey bar. In the mean time I've been working on a new group of ebay paintings for next week. 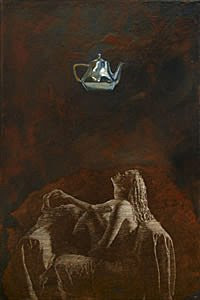 At the moment I have two underpaintings done, and three drawings. It feels like a good group. The first of these will show up on ebay monday night at nine. Anyone interested in bidding on any of my current offerings can access my listings page by clicking here. I've returned once again to one of my favorite subjects. I don't know what more I can say about this particular theme, other than I get a huge amount of pleasure from painting these colorful spheres. Plus, there's something very appealing about composing them in a glass bowl. At least for me that is. I especially love the distortion imparted by the ridges in the bowl. Even though it's a small painting, and please excuse my enthusiasm for my own work, but I think this could be one of my favorite incarnations of this theme. I'm very happy with it. I spent an unacceptable amount of time on it, hence the inflated reserve price I've placed on it for ebay, but it seemed to be going in a good direction, so I just went with it. 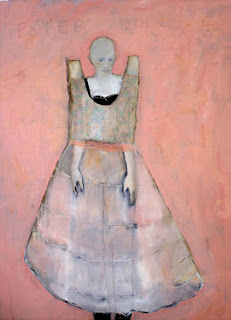 Karen and I are heading into town this evening to attend the opening night reception at Mason Murer Gallery promoting our friend, and awsome artist Jeanie Tomanek. It's a group show which includes Jeanie, and two other artists. 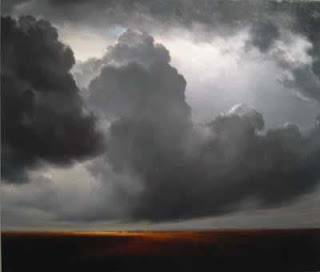 One of the other artists is James McLaughlin Way. A man Karen and I bow down to in most humble admiration. His huge landscape paintings, literally leave me speechless. That's it for now. If I have enough time I may be able to complete the under painting of the second commissioned piece today. We will have to quit early today to make the show, so it may not be completed until tomorrow. In any case it's currently looking as though I may be able to finish it within seven days. My original goal for each of these large paintings. 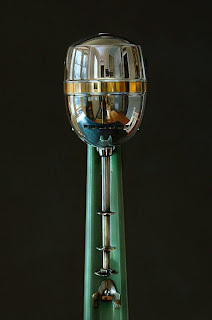 Anyone who is interested in bidding on Pool Bowl No. 5 can link to the auction by clicking here. 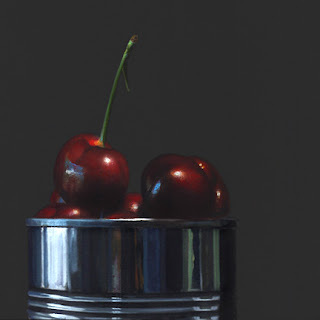 This is an alternate crop of the the Cherry Can I painted for the winter show at Twinhouse. I took a lot of photographs of this subject, and always intended to utilize more of the many images resulting from that shoot. It is very likely, that in the future, there will be a few more paintings similar to this one. Work on the second full sized commission painting is coming along. It's slow going. If all goes well it should be completed in about five days.